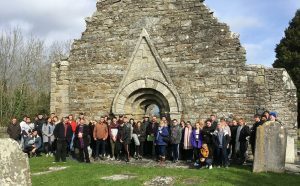 MEDIA students from IT Carlow embarked on a joint project with theology students from Carlow College for an event called Architecture of beliefs and rhythms of ritual. The aim of the project was to explore ‘the construction and realisation of religious space in contemporary culture’ by looking at ancient and contemporary religious sites in Co Carlow. The media students, accompanied by lecturers Paula Mulroe and Rolf Zaska, recorded the visit to the sites for a podcast. The event included visits to Cranavane Holy Well in Kildavin, Ballinacarrig Cemetery and the Romanesque doorway in Killeshin.